"Well-planned and carefully assembled, The Watchful Heart adds to the pleasures of all good collections a distinctive bonus: as readers we get to hear each poet's voice in, so to speak, two mediums: poetry and reflective prose. It gives a fascinating cross-section of Irish poetry at the present time." The Watchful Heart - A New Generation of Irish Poets - Poems and Essays is an anthology of the work of twenty-four Irish poets born in the last fifty years. It contains biographical and bibliographical details of each contributor, together with photographs. All poets included have published at least two collections of poetry. Poetry in Irish with translations is also included. None of the poetry in this anthology has previously been published in collection form and most of the essays are published here for the first time. McBreen's anthology The White Page/ An Bhileog Bhán: Twentieth-Century Irish Women Poets (Salmon Poetry, 1999) is now in its third reprint. Pat Boran, Mary Branley, Patrick Chapman, Louis de Paor, Anne Fitzgerald, Leontia Flynn, Margaret Galvin, Alan Gillis, Kevin Higgins, Gearóid Mac Lochlainn, John McAuliffe, Mary Montague, Kate Newmann, Nuala NÃ­ ChonchÃºir, John O'Donnell, Mary O'Donoghue, Paul Perry, Justin Quinn, Eileen Sheehan, Peter Sirr, Cherry Smyth, Damian Smyth, David Wheatley, and Joseph Woods. Into the fierce conflicting tides. Once a year, a vet makes the journey. As the ocean's drowning pull. Like a calf being cleaned. That will always return. That never left. 1910, oak-panelled and smelling of oak. of the billiard-table long gone missing. from the pair of us and one imagined, the dead. Joan McBreen performed a major service to Irish poetry when she brought together the work of 113 Irish women poets in her 1999 anthology, The White Page /An Bhileog Bhán: Twentieth-Century Irish Women Poets (Salmon Poetry). That book sought to correct the imbalance in the representation of women writers in Irish poetry anthologies and proved in the process that Irish women's poetry was vibrant and diverse. 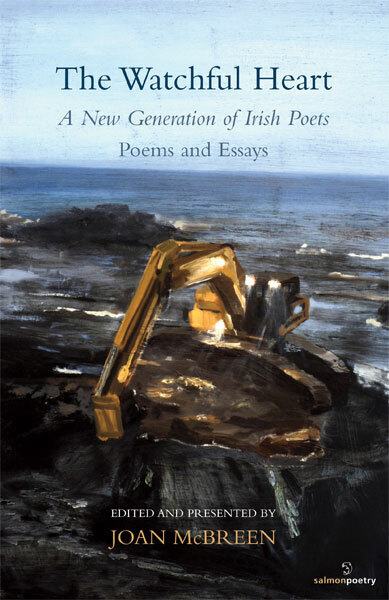 As a poet included in that anthology, I turned to McBreen's latest collation with anticipation and curiosity; given the slew of anthologies of Irish poetry over the past few years (for example, Bloodaxe's The New Irish Poets), I was intrigued to see what rationale she might use for her latest choice. The Watchful Heart contains the work of twenty-four poets who represent, for McBreen, the new generation of Irish poetry. Each was born in the last fifty years, has published at least two collections of poetry and wasn't featured in The White Page. Each poet has also contributed three poems, along with an essay in which they explore an issue close to their hearts as poets. The editor points out that had she also drawn on the poets contained in The White Page, she would have produced a volume far larger than either she, or her publisher, intended. So here we find ten women and fourteen men, representing what McBreen terms 'some of what I felt would be the best of recent Irish poetry'. She makes no claims that her selection is either 'comprehensive' or 'all-inclusive', a statement that rather dilutes the fun for the reviewer, of course. How can one possibly rant away about the exclusion of Mr X or Ms Y in the face of such reasonableness? on the winter deck, the unplanted earth. I promised earlier that I wouldn't be one of those reviewers that berates an anthology for its omissions. Each editor is entitled to their choice, for poetry is a subjective business. I did rather wonder why there was no place for Leanne O'Sullivan here (perhaps her fine second collection Cailleach: The Hag of Beara, from Bloodaxe, came too late to make her eligible), but I was delighted to read other fine poets, such as Paul Perry, Kevin Higgins, Anne Fitzgerald, Mary Montague, Alan Gillis, Joseph Woods, Damian Smyth, Eileen Sheehan and Kate Newmann. There are many others - Dave Lordan, Ann Leahy, Ciaran Berry and Nell Regan to name a few - who have made impressive débuts over the last decade and who will surely appear in future anthologies. The Watchful Heart may not be the last word on Irish poetry at the start of the twenty-first century, but it provides a pretty good taster.